Wham! 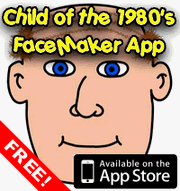 were undoubtedly one of the biggest bands of the 1980’s, with George Michael (real name Georgios Kyriacos Panayiotou) and Andrew Ridgley becoming household names for a large proportion of the decade. Whilst most of the credit (and fans adoration) for the band generally goes to George, being main vocalist and song writer, it was Andrew who kept the style of the band fresh, adapting their look to match the songs they created. However, whilst it might seem amazing now, Wham! very nearly may not have taken the UK by storm in the way they did if it wasn’t for Top of the Pops. 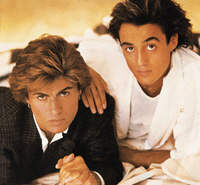 The boys first started a band called The Executive in 1981, but soon changed the name to Wham! and their first single Wham Rap was released. You might be surprised to learn it tanked at the time, mainly due to a UK ban as it was a double A-side single containing two versions of the song, the social mix and the anti-social mix, the latter version attracting the ban. In the summer of 1982 they released Young Guns, which was struggling outside of the top 40 when the band appeared on Top of the Pops thanks to another act dropping out, but in the end made it to number 3. From that moment on girls around the UK became enamoured with the group, particularly George Michael who at the time was yet to reveal that he was gay. Whether this would have made a difference or not I can’t say, but their first album, Fantastic, shot to the top of the album charts. A re-release of Wham Rap in 1983 saw it hit the top ten this time round, and in the same year Club Tropicana and Bad Boys both stormed the charts as well. As the years went by Wham! enjoyed repeated chart success, topping the UK charts four times with disco favourite Wake Me Up (Before You Go Go), Freedom, I’m Your Man and The Edge of Heaven. They narrowly missed out on a Christmas number one with Last Christmas, beaten only by Band Aid and Do They Know It’s Christmas, but given this featured George Michael anyway he can’t really complain. In 1986 Wham! announced they would be splitting up, which whilst it saddened fans was predictable given that George Michael had already started his solo career with Careless Whisper.Â They went out with a bang though, playing to a sell out crowd at Wembley stadium for a single farewell concert.Â They boys could probably have sold enough tickets to fill Wembley several times, but they were adamant that they only wanted to play a single date. After that, George Michael has enjoyed great success as a solo artist, reinventing his image in 1987 with the release of Faith.Â He may have courted controversy a few times since then, but he is still a very popular singer today.Â Andrew Ridgley on the other hand had little success with his solo career, and after trying his hand at both acting and, bizarrely, rally driving, moved to Cornwall where he is a partner in a firm making surfing equipment and campaigns for environmental group Surfers Against Sewage.Â He is also married to Keren Woodward, better known as one third of eighties girl band Bananarama. This entry is filed under Music - Artists	and was posted on July 15th, 2008. You can follow any responses to this entry through the RSS 2.0 feed. You can leave a response, or trackback from your own site. OK, I have a question. I was OK with the whole update until the last sentence where it says he is married to a woman. I thought he was gay???? Seriously. WHAM came to Columbia, SC once and a friend was involved in the concert. He told me then that he walked in on George and Andrew kissing. What gives? ?